Can I display my products by Manufacturer? Absolutely! 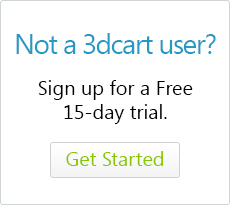 You can add manufacturer details to your 3dcart store and essentially create an added level of navigation to your store. Along with being able to browse your store by category, and pricing ranges; Manufacturer listings also give your customers the advantage of browsing items based on brand names! The task of setting up Manufacturer listings is a two step process which involves first setting up your manufacturers and then assigning the manufactuer specific products to that listing. This article will detail the process. The manufacturer's brand site if available. The Manufacturer's Website does not directly display on your live site. The field is merely available if you'd like to have it in place for internal reference. This can be used to display a copy of the manufacturer's brand logo on the manufacturer listing pages. Specify the listing order which this manufacturer will fall under. Lower numbers are displayed before higher numbers. Use this field to control the Manufacturer Listing Page's title for SEO purposes. Specify header information for the manufacturer listing page if desired. After adding your Manufacturer details, click "Save Changes" at the top right to continue. You can also import Maufacturer Listings in bulk via the store's Product CSV Export/Import functions. The next step in our process is to assign products to their respective Manufacturers. Search for and select the product that you'd like to edit. Click on the product's name, or look to the far right of the product listing and click on its "Action ->Edit"
Click "Save" at the top right. The product will now display on the Manufacturer's listing page of your store. You can also assign manufactuers to products in Bulk by using the store's built-in CSV export/import functions. The regular product CSV export file can be used for this purpose. As a bonus: Once you've completed adding your Manufacturers to the store and assigned products to those manufactuers, you can also use the manufacturer listings themselves as a filter for export files. Repeat for all your manufactuers and their respective products. If you add a logo to your Manufacturer Listing, you can then use the dynamic variable "[manufacturer_logo]" on your product listing pages as an image source tag in your product descriptions to automatically have the logo display along with the product.